Polpette Grande, the Giant Meatball, at Siena Restaurant on Atwells Ave.
As a pisan, I love Federal Hill. I love the little start-up espresso shops, the abundance of Italian grocery items at Venda Ravioli, and the tasty treats at Pastiche. 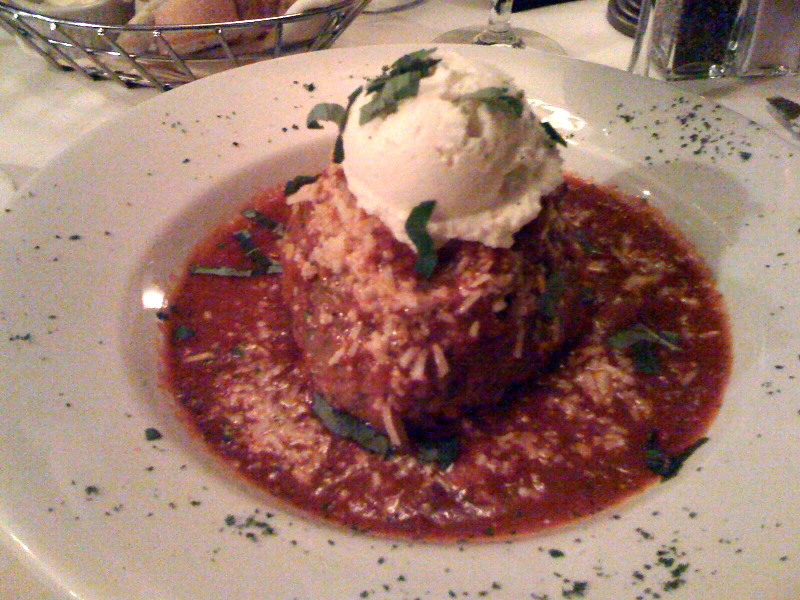 But perhaps most of all, I love the giant meatball, or as they say in Italian “Polpette Grande.” This appetizer at Siena Restaurant on Atwells Ave consists of an enormous meatball made from ground sirloin, veal and pork, topped with San Marzano marinara and a large scoop of a homemade ricotta cheese. My phone camera photo truly doesn’t do it justice — you’ll have to go and see (and taste) for yourself. Overall, the food at Siena is quite good. But it’s that giant meatball that keeps me coming back.